The Powerball jackpot ticket that produced an as yet unknown $487 million winner last month was bought at the Raymond Hannaford Supermarket, and has now generated a huge win for local children and hungry individuals. Hannaford announced that it would donate its $75,000 commission from selling the winning Powerball ticket and would provide an additional $25,000 so as to be able to donate $100,000 to Raymond-area hunger relief food pantries, a school-based anti-hunger organization that serves all of New Hampshire, and a Raymond-based youth coalition. 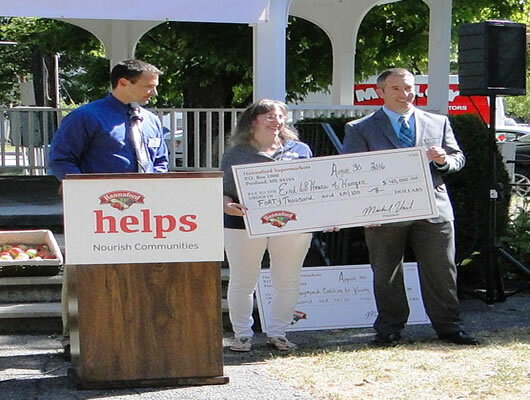 Hannafords adds 25K to its 75K winnings to donate to organizations. 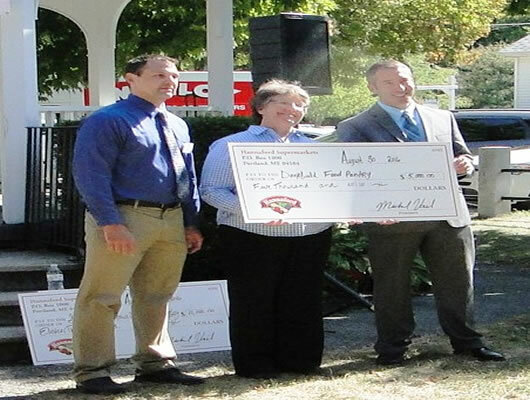 Hannaford Supermarkets and New Hampshire Lottery personnel and representatives from the organizations receiving the donations gathered at the Raymond Town Common on Tuesday morning, Aug. 30. Hannaford Raymond Store Manager Dan Wilder said, "It's not every day that your store finds out it has sold one of the biggest jackpot lottery tickets in history. We wanted to use this good fortune to help people in need in Raymond and in New Hampshire as a whole. This $100,000 Hannaford Helps donation will make a real difference in the lives of local children and families. It is just great to be able to give back to the community - this is a win-win for the store and the community, and today I feel like I won." 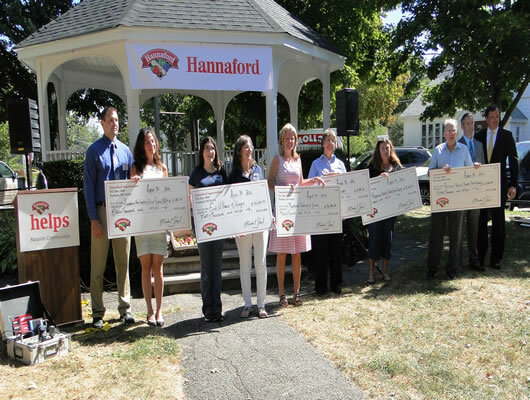 All donation winners holding their checks from Hannafords. Charlie McIntyre, executive director of the New Hampshire Lottery Commission, applauded Hannaford for making such a meaningful and impactful donation. "During my six years with the New Hampshire Lottery I do not recall another instance of a New Hampshire Lottery retailer donating a commission check to charity, particularly one of this magnitude, and the New Hampshire Lottery celebrates Hannaford Supermarkets for its generosity," he said. • End 68 Hours of Hunger, $40,000. • Raymond Coalition for Youth, $30,000. • Food pantries as follows: Raymond Baptist Food Pantry, $3,000; Providence Baptist Church Food Pantry, $11,000; Deerfield Food Pantry, $5,000; and Southern New Hampshire Services Food Pantry, $11,000. End 68 Hours of Hunger puts food in the hands of New Hampshire schoolchildren to carry them through the weekend. Each bag of food costs $10 each week and provides two breakfasts, two lunches, and three dinners for a child, with some leftovers to share. Founder Claire Bloom said the Raymond chapter is directed by Sarah Gates and Tanya Martin, and noted that volunteers are needed to help pack and deliver the food. 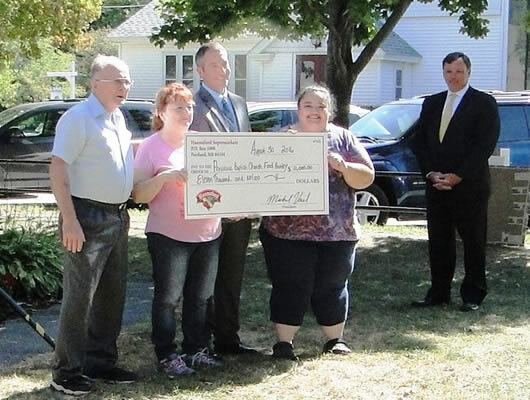 The organization's plan is to use 50 percent of the donation to fund the Raymond program for an entire year and the other 50 percent to start a new program within the Hannaford catchment area. Raymond Coalition for Youth Executive Director Celeste Clark said, "The Raymond Coalition For Youth is honored and beyond grateful for this very generous donation. Hannaford invested in RCFY when we first became a nonprofit in 2004. It was our first donation and provided us a platform to reach out into our community and build ongoing relationships with people who wanted to support our youth and give them a voice. Selectman Jack Barnes, representing the Raymond Board of Selectmen, said, "I think this contribution by Hannaford is outstanding and the involvement and generosity of the Hannaford Supermarkets and what they have done for various organizations in Raymond is greatly appreciated by the Board of Selectmen. The board thanks them." 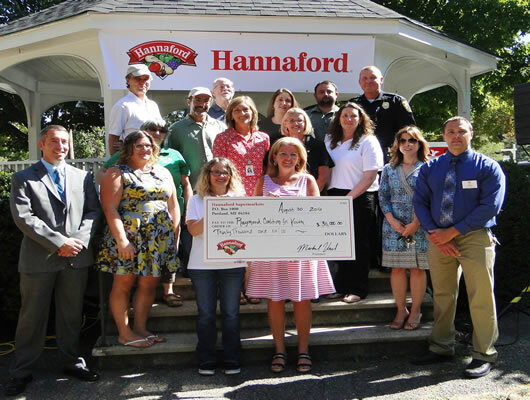 Raymond Police Chief David Salois, a board member of Raymond Coalition for Youth, said of the Hannaford contributions, "It is huge for all the youth and other folks in the community. 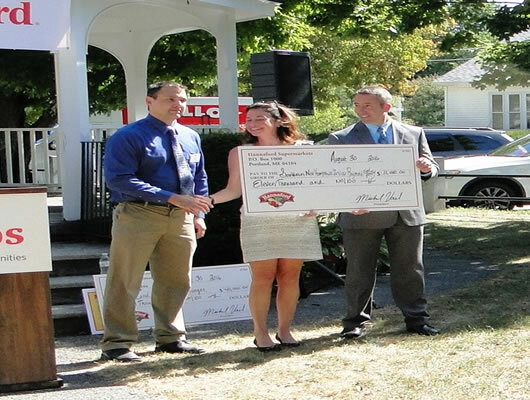 Hannaford is acting as a community partner by investing in the community and its people." John Fifield, Hannaford's Director of Operations for Southern New Hampshire, noted, "Helping children lead healthy lives and supporting those people who are at risk of going hungry are two of the major focus areas for Hannaford's charitable efforts. With today's special Hannaford Helps donation, we are proud to build on the $4 million and 20 million pounds of food a year we donate to support our communities."